a new thing. — SOMEDAY, SARAH. my shirt reads, I BELONG TO JESUS. it feels like the most obvious statement i could make. i belong to Jesus. of course i do. i always have. i cannot think of a single moment in my life where i didn't understand this to be true. but here i am, literally wearing this statement across my chest, getting baptized. again. the first time i got baptized, i was 19. nine years later, i'm circling back around to it. i used to think faith was linear. that you hit different milestones like rungs on a ladder. getting saved would be like stepping on the ladder. 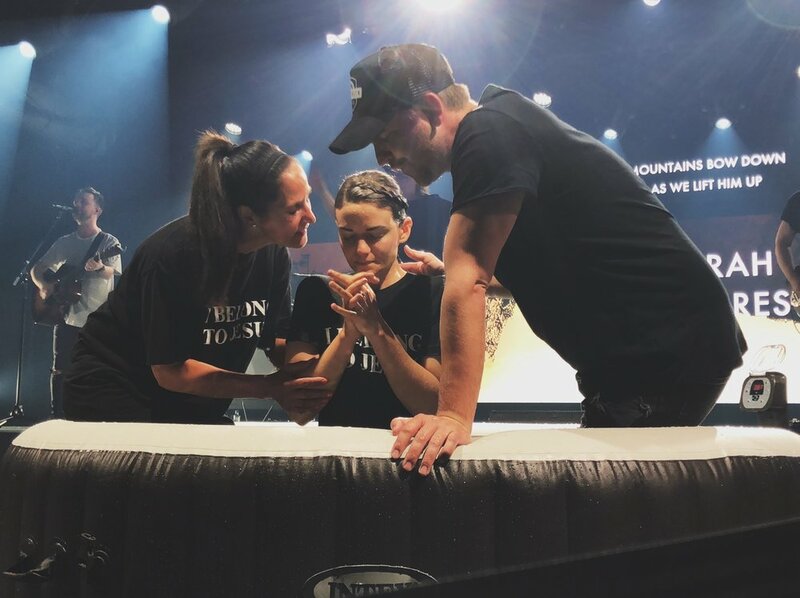 you move up when you get baptized, when you get filled with the Holy Spirit and speak in tongues, when you beat an addiction, when you go through a hard time and come out on the other side still believing God is good. whatever it is, you advance. you move forward. to go back would be unnecessary, maybe even counter-productive. i was always getting tangled up in this thought process. i carried a bit of pride for the advances i'd made and would think things like, "i know that" or "i did that." like i was beyond that. on the flip side, i wore a thin layer of shame for each time i had a new revelation. i would wonder out loud, "why am i just now realizing this? it feels so obvious." but here is the thing. faith is not linear. the truth is not something you learn once and then move past, on to the next thing. there is no next thing. there is just the truth. when i got baptized the first time, i did it because i understood what it was and why a person should do it and i was taking that next step in my faith. at the time, it felt important. and it was. but it was purely symbolic – being buried with my sin; being raised to life in Christ. because He died, for real, so that i wouldn't have to. so that my act could be a symbolic one, in water, to publicly declare my faith. i knew its importance. i did the thing. i belonged to Jesus. see? but my faith was thin and frail and shakable. and yet, still enough. but throughout the past three years, God has been breaking down my linear thought process and taking me in circles. around and around the truth, adding a little bit more weight to my faith each time. i've said "i already know this," "i've already done this," "i thought i was past this," and – my favorite – "how am i just now realizing this?" over and over. i've had to say goodbye, i've had to walk away, and i've had to let go. of things i was happy to part with, and things that felt like they took pieces of my heart with them. things that were toxic, and things i loved – which were, more often than not, the same thing. again and again. until there was nothing left. until my hands were empty. until it was just me and my praise and the truth. the truth, which i kept picking up and thinking, "okay, and what else?" or "okay, and what about [this thing i think is also important]?" but there is no "and." it's Jesus. only Jesus. that's the thing. the same thing. the obvious thing. but it's a weighty thing. keep circling back to it. when i got baptized this time, it was for the same reasons, except it carried more weight. this time, i can name the things that are left, dead in the water. the things that i've given up, broken off and carved out of me. this time, i have not only been raised to life in Christ, but i'm stepping in that authority. into that freedom. i not only know what i was saved from, but what i was saved for. this time, i wanted to let you know. I BELONG TO JESUS. and it may sound like the same, old thing. an obvious thing. an i-already-know-that thing. but He is doing a new thing. and i want in.